The newest addition to the Fort Wayne arts scene is the Wunderkammer Company’s downtown gallery. Wunderkammer Company is a nonprofit organization led by Dan Swartz, a Fort Wayne native and independent curator. Dan has been described by some as an “art instigator,” and that may be true, but at his core he is a driven and dynamic force of nature. You cannot be in Dan’s presence and not be inspired to do or create something. Therefore, it isn’t surprising that the mission for his project is grand and important: to revitalize communities through contemporary art. So far, he is succeeding. The gallery opened in January 2013 and has hosted a number of shows, including Fort Wayne Fringe featuring dance and other performance art. [gallery ids="9371,9369,9370"] Wunderkammer Company&apos;s next trifecta of exhibitions includes, "Three Ladies", "Texted Riot", and "Not Tara Donovan.” "Three Ladies" is a historic and educational exhibition honoring the lives and accomplishments of Margaret Ann Keegan, Helene Foellinger, and Madolon "Madge" Rothschild. These three women made crucial and lasting positive contributions the Fort Wayne community during their lives and through their continued charitable spirit once passed. "Texted Riot" is a group exhibition featuring five artists focusing on text, or written language, in art and "Not Tara Donovan" is as described in the gallery’s release “an installation produced by W< questioning the validity of an art piece when the audience is immediately queued into the processes which took place to create it.” The public is encouraged to contribute to the installation, and is "let in" on the “inside jokes within the contemporary art world.” Wunderkammer Company is an extraordinary member of the Fort Wayne art community; it will challenge, entertain, and educate all who are open to it. 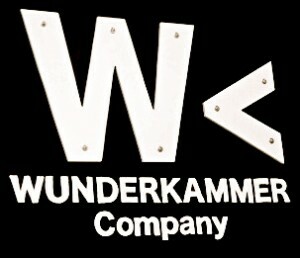 Check out these shows or visit Wunderkammer Company’s Facebook page and learn more. These three exhibitions opened on Saturday, April 20th, and will continue through May 19th (Texted Riot until May 26th). Wunderkammer is located at 3402 Fairfield Avenue in Fort Wayne. Suggested donation is $2.00.